Michael Tanna opened his shop at 10 Lodge Road in 1980. He took the lease from the Church of England (and it used to be a post office). He ran the shop as a newsagents, together with cigarettes and sweets. Teenagers used to deliver the papers before they went to school. At that time his was the only shop in the road, and the premises had been empty for some time. There was a small café next door. Number 4 Lodge Road had been a tailor’s shop. The lease was owned by Messilla Road properties and they agreed to let him have it in 1986. 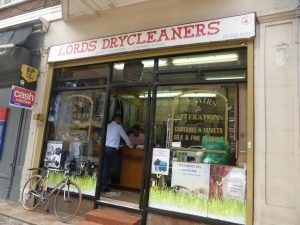 He had seen the need for a drycleaners business in the area. He ran the two shops for several years and then decided to give up the newsagents. Michael was born in Jamnagar, Gujarat, in 1958 and being the youngest of seven children, says he was spoilt as a boy! His father was a trader in India, and Michael learnt something about office accounts from him. He gained a BSc degree at University. He was always good at figures. Michael came to the UK in his 20s knowing nothing and nobody in London. He rented a box room in Hendon. One day he was peering through the window of the Job Centre “What is this Job Centre, he wondered? when an old lady came out, very nice she was, and asked me what I wanted” She found him a position as a temporary bookkeeper for an opticians in Finchley for £40 a week. He had to save the money to obtain his shop in Lodge Road. It was a difficult decision but he decided to take the plunge and so,with extremely hard work made a success of it. Michael knows that customers in the early days cheated him, as he did not know the price of, say, a Mars bar. And with several customers in the shop, he might just accept what they gave. Vinery Villas opposite were pulled down and the area between Lodge Road and the Regents Canal was a building site before Regents Court and Beverley House flats were completed. The café closed at about 2pm and after that, he was the only one there. So, people would know when he was on his own in the shop. He used to bring his white Alsatian dog, Lily, to work at 5am. She was extremely well trained and obeyed his commands. She was clever too. Michael took her along to Dora House, where he himself would deliver the papers down the long corridors inside. The dog would stop outside the correct doors where a delivery had to be made every day. She knew! Michael still opens the shop at 8am and with shifts, it stays open till 7pm. In 1979 Michael married and has two daughters born in 1980 and 1983. Now Michael has grandchildren, whom he loves dearly. In 1986, when Michael had decided to buy the lease for number 4 Lodge Road and set it up as a drycleaners establishment, the machine manufacturers gave him the costings for starting the business. They helped him with what he needed to learn and sent him to see how others were working, particularly a Turkish company near the Angel, Islington. He watched in order to learn the process. You have different chemicals for light and dark clothing and they must be used in the machines in the right order. In fact he has had only two cleaning machines in the last 32 years. He also has the steam machine and the pressing machine. When he joined the Textile Services Association (TSA) he went on their courses, including: what to look for in a garment; how to run a cleaning business; and stain removal. The chemicals are strictly regulated, every amount bought must be accounted for, and the forms filled in to be sent off to the authorities. You must also show how you dispose of the chemicals and provide forms and invoices for that too. 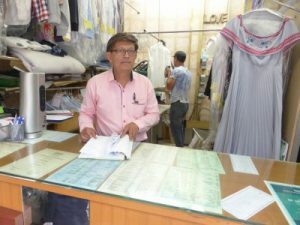 In Michael’s small property of 350 sq feet and 150 sq feet at the back, he had always had a presser, for the ironing, and a tailor for alterations. Michael is not always at the front desk so his staff must be trained to deal with customers when he is not there. The hotel came to him first to ask him to clean staff uniforms, as they did not trust recommending him for the guests’ drycleaning. In the old days in order to build up his reputation with customers, Michael would go out to the laundromat if necessary to do the washing and then come back for hand pressing to speed up the delivery time. When the hotel was owned by the Hilton chain, Michael ran the its souvenir shop as well as the other two in Lodge Road. He would go to Indian wholesalers for supplies of jewellery and decorative items and had two women assistants there. This made 12 staff in all for the three shops. (The employment of staff has become more onerous with EU regulations). So now Michael has had a long association with the Hotel, now the Danubius, who trust him completely. Drycleaning today has become so much more sophisticated and specialised. “Damp shirts are put onto a dummy of the right size which is then inflated to smooth out the creases”. Textiles are made of complex combination fibres now, which is tricky for cleaning and stain removal. Michael subcontracts leather jackets, suede and fur, handbag cleaning and repair. He outsources shoe repairs. He has done St John’s Wood Church vestments for many years. Before a change of tenant, estate agents use him to organise the cleaning of entire flats, with curtains, carpets, rugs and bedding. If it is an individual customer, Michael likes to speak to them and make sure that they understand what is involved and what might be the result of treatment to the item. With his long experience, he can tell what the likelihood might be of getting a stain out, whatever the label says. St John’s Wood has changed over the years. The Arabs used to come and stay for many months in the summer. Now there are more Orientals. And Americans too. Rent and rates have increased enormously. New blocks of flats continue to rise up. Michael, Lord’s Cleaners, collects and delivers for free from the residents in the flats all around NW8 and his business is based on his reputation for honesty and getting the work done on time, whether it is actually completed in Lodge Road, or sent out again to the specialists required. If something goes wrong, he will put it right. He is responsible for the quality of the service. He will guide people on how to do it at home to save money if they wish. Positive online reviews from such sites as Google and Yell speak of bespoke service with a smile. There is a long list of professional cleaning which Michael can provide. 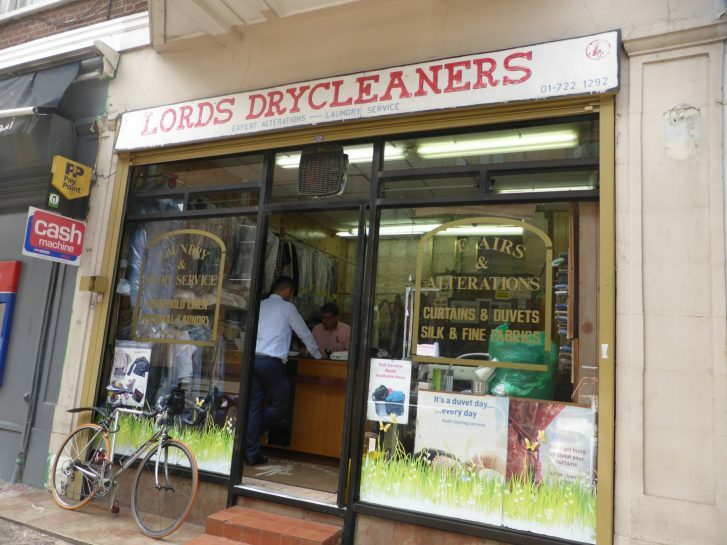 This also now includes a service wash, steam and fold, charged by weight, which takes the place of the St John’s Wood laundromat which closed down. This page was added on 03/08/2018.